Editor’s note: The following account is partially excerpted from the author’s new book, Sword and Scimitar: Fourteen Centuries of War between Islam and the West (with a foreword by Victor Davis Hanson). Fresh meat appeared on the horizon once the newly born United States broke free of Great Britain (and was therefore no longer protected by the latter’s jizya payments). In 1785 Muslim pirates captured two American ships, the Maria and Dauphin, and enslaved their crews. Considering the aforementioned treatment of white slaves, when Captain O’Brien of the Dauphin later wrote to Thomas Jefferson that “our sufferings are beyond our expression or your conception,” he was not exaggerating. We took the liberty to make some inquiries concerning the grounds of their [Barbary’s] pretentions to make war upon nations who had done them no injury, and observed that we considered all mankind as our friends who had done us no wrong, nor had given us any provocation. The ambassador answered us that it was founded on the laws of their Prophet, that it was written in their Koran, that all nations who should not have acknowledged their authority were sinners, that it was their right and duty to make war upon them wherever they could be found, and to make slaves of all they could take as prisoners, and that every Musselman who should be slain in battle was sure to go to Paradise. One need not conjecture what the American ambassadors—who years earlier had asserted that all men were “endowed by their Creator with certain inalienable rights”—thought of their Muslim counterpart’s answer. Suffice to say, because the ransom demanded was over fifteen times greater than what Congress had approved, little came of the meeting. Back in Congress, some agreed with Jefferson that “it will be more easy to raise ships and men to fight these pirates into reason, than money to bribe them”—including General George Washington: “In such an enlightened, in such a liberal age, how is it possible that the great maritime powers of Europe should submit to pay an annual tribute to the little piratical States of Barbary?” he wrote to a friend. “Would to Heaven we had a navy able to reform those enemies to mankind, or crush them into nonexistence.” But the majority of Congress agreed with John Adams: “We ought not to fight them at all unless we determine to fight them forever.” Considering the perpetual, existential nature of Islamic hostility, Adams was probably more right than he knew. 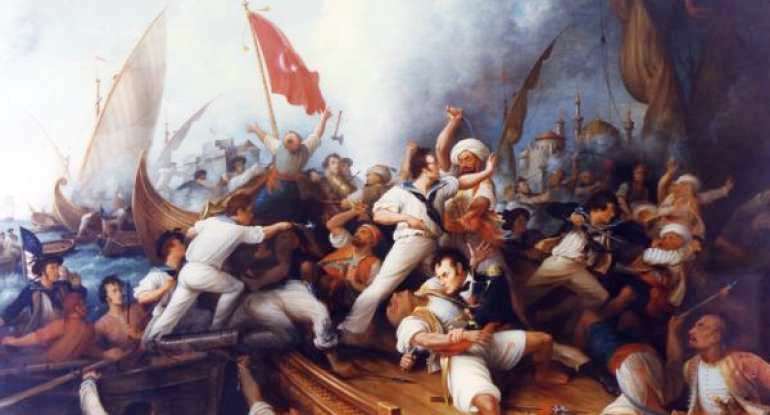 When Muslim pirates from Algiers captured eleven more American merchant vessels in 1794, the Naval Act was passed and a permanent U.S. naval force established. But because the first war vessels would not be ready until 1800, American jizya payments—which took up 16 percent of the federal budget—began to be made to Algeria in 1795. In return, over 100 American sailors were released—how many died or disappeared is unclear—and the Islamic sea raids formally ceased. American payments and “gifts” over the following years caused the increasingly emboldened pirates to respond with increasingly capricious demands. Thus and despite the (rather ignorant) question that became popular after the terror strikes of 9/11—“Why do they hate us?”—the United States’ first war and victory as a nation was against Islam; and the latter had initiated hostilities on the same rationale it had used to initiate hostilities against non-Muslims for the preceding 1,200 years (as documented in my new book, Sword and Scimitar: Fourteen Centuries of War between Islam and the West). Of course, because the prophet of Islam had said “Whenever you [Muslims] take an oath to do something and later you find that something else is better than the first, then do the better one”—and because subjugating and plundering infidels was/is always “better” than an “oath” of peace with them—when war broke out again between the U.S and Britain in 1812, Barbary saw its chance, reneged on the treaty, and again began to raid American ships and enslave their crews, leading to the Second Barbary War.